Simple Green Lime Scale Remover uses an organic salt formula to dissolve lime scale, mineral deposits, hard water stains, soap scum and oxidation. The non-abrasive formula won't strip protective finishes, cause discoloration, etch or damage sensitive surfaces like other harsh descalers. 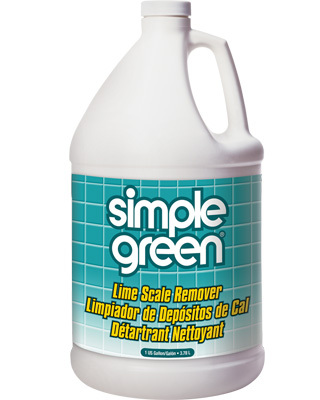 Simple Green Lime Scale Remover dissolves lime scale, mineral deposits, hard water stains, soap scum and oxidation from sinks, faucets, showers, sprinklers, equipment, hoses and other surfaces. The non-abrasive formula is safe for ceramic, glass, stainless steel, chrome, copper and more. WARRANTY PROVISIONS: Purchaser's sole and exclusive remedies for breach on any warranty concerning this product shall be replacement of the product, or, at the option of the manufacturer, refund of the purchase price, upon return of the unused portion of the product, together with proof of purchase. Manufacturer shall not be liable for any consequential or other damage resulting from product use.